The argument over whether or not to get a vaccine has been raging for decades. For the most part, people get vaccines in an effort to prevent becoming seriously ill. When a vaccine is administered it is done so using a weaker version of the illness. This allows the body’s immune system to build up a defense to the illness over time so it can fight it off down the road. There are risks to getting vaccines, including reactions and injuries. SIRVA is a type of vaccine-related injury that can happen for various reasons. Let’s take a look at SIRVA, how it’s caused, and how it relates to workers’ compensation in today’s post. SIRVA is short for Shoulder Injury Related to Vaccine Administration. This is pretty straightforward. SIRVA is an injury patients suffer when the vaccine they received caused an injury to their shoulder or surrounding area. This most often happens when a vaccine is injected into the body too high up on the shoulder or when it is injected too deeply into the body. There’s always a risk that a patient receiving a vaccine develop SIRVA but it is still a rare side effect of vaccine administration. Treating SIRVA is fairly easy as it is most often done using pain medication. Physical therapy is another option and so is topical pain medication applied to the affected area. The medication prescribed will be anti-inflammatory so that your range of motion can improve as the swelling subsides. If the injury is severe enough it could result in you needing vaccine injections of cortisone to help treat it. The most severe of cases require surgery to repair damaged areas of the shoulder. All of the above sounds expensive – and is. Many patients who suffer from SIRVA wind up noticing their financial resources are drained. The only way you would be able to obtain workers’ compensation for injuries sustained when getting a vaccine is if the vaccine was recommended or required by your employer. If this is the case, it would mean that the vaccination was part of the scope of your employment. 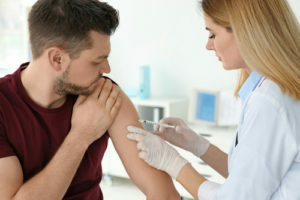 There will be a direct correlation between SIRVA and workers’ compensation if the employer offered administration of the vaccine at the office. There are times when the United States government issues vaccines to residents. If you suffer from SIRVA following a vaccine administered by the government you will be eligible for compensation from the government. Compensation is provided through a fund known as the National Vaccine Injury Compensation Program, or VICP. A workplace injury can be devastating, particularly if it prevents you from returning to work for an extended period of time. Although NJ Workers’ Compensation laws are supposed to provide you with reimbursement for medical expenses and replacement pay for missed time at work, it is not always easy to get the Workers’ Comp benefits you deserve. That is why you should speak with a knowledgeable Workers’ Compensation lawyer about your situation and get guidance throughout the claims process. The experienced Workers’ Compensation attorneys at Hoyt & Hoyt represent clients in Mount Olive, Parsippany, Roxbury, Rockaway and all across New Jersey. Call 973-292-2299 or email us today to schedule a consultation about your work injury case. Our main office is located at 67 East Park Place, 5th Floor Morristown, NJ 07960 and we also have offices in New Brunswick.